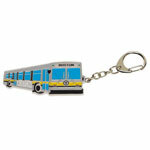 Hold your keys or adorn your backpack with these fun and whimsical Boston MBTA vehicle keychains! Solid metal key chain is modeled after a subway car from the MBTA Orange Line. The official T logo is featured on the front of the car and Boston is written on the side. Key chain body, chain, and clasp are cast zinc alloy. Body features detailed, painted epoxy enamel finish in official MBTA colors. Subway car body is 2 3/4" wide x 1 3/4" tall. Entire key chain is 5" long including chain and clasp. Official Licensed Product of the MBTA.